TRICOLI: When will patronage jobs stop? UB football's "Flash Sale" set for Thursday! ROCHESTER, N.Y. -- Men with advanced cancer are 30 percent less likely than women to consider palliative care, according to a University of Rochester Medical Center study. Researchers believe the findings reflect social norms about gender roles — as well as widespread messages in the media and society about “fighting” cancer. Often men see themselves as the family protector, said the study’s lead author, Fahad Saeed, M.D., a palliative care specialist and assistant professor of Medicine and Public Health Sciences at URMC. When struck with a serious illness they usually want to be cast as a “fighter” or a “warrior,” and may view palliative care as giving up, he explained. Scientists analyzed data from 383 individuals with advanced cancer between the ages of 22 and 90, who had been asked about their preferences for palliative care. Response options were: definitely no, possibly no, unsure, possibly yes, and definitely yes. The analysis accounted for other factors such as aggressiveness of the cancer, age, race, and financial status, but gender was the only factor that significantly influenced preference for palliative care, according to the study, which was published in the Journal of Pain and Symptom Management. The research is consistent with other studies showing that men also are less likely to sign do-not-resuscitate orders at the end of life, Saeed said. For this study, palliative care was defined as “comfort care, focusing on quality of life.” All of the patients had advanced cancer. Is “fighting” compatible with palliative care? Yes, according to Quill, because palliative care can begin at diagnosis or during any stage of a potentially life-threatening disease, and it can be delivered along with curative treatment, such as chemotherapy or immunotherapy. In fact, evidence shows that some patients can live substantially longer when they receive palliative care in addition to other therapies. 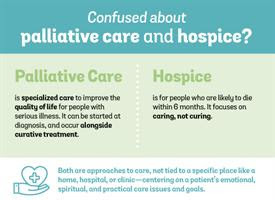 Patients in the study may’ve been confused by the differences between palliative care and hospice —a common issue — as well as fear of end-of-life discussions, noted Quill, a professor of Medicine, Psychiatry, Medical Humanities, and Nursing at URMC. Palliative care is designed to help patients navigate emotions, as well as to relieve symptoms such as pain, shortness of breath, or other medical issues that arise from the illness or its treatment. The aim is to address the whole person, not just the cancer. “A lot of people with a life-limiting illness want to stop and consider: Are there more important things I can do? Opening that door might result in exploring relationships, making a job change, getting back in touch with religious beliefs —whatever is meaningful to that person. Because the focus is on improving quality of life, palliative care can also help families cope with their grief if the patient does not survive, the study noted. Still, some men are hesitant to express the symptoms and emotions they are experiencing, viewing it as a sign of weakness, Saeed said. And since palliative care is all about symptom management, that becomes a problem. For example, the study noted that physicians should take into account gender differences while talking about palliative care, and be mindful of a tendency for some patients to be stoic and invulnerable. The National Cancer Institute supported the research. Saeed is a mentored career development program scholar at URMC. Other co-authors from URMC and the Wilmot Cancer Institute are: Ronald Epstein, M.D., professor of Family Medicine, Psychiatry, Oncology, and Medicine (Palliative Care); and Sally Norton, Ph.D., R.N., F.P.C.N., F.A.A.N., a co-director of research for the Division of Palliative Care and the Independence Chair in Nursing and Palliative Care at the UR School of Nursing.